?Grow longer on the flesh of those that would opress you?, reads the description for Jonathan Whiting?s new elongated flesh snake game BLOODWORM [official site]. Yeah, it?s probably a metaphor for wangs. 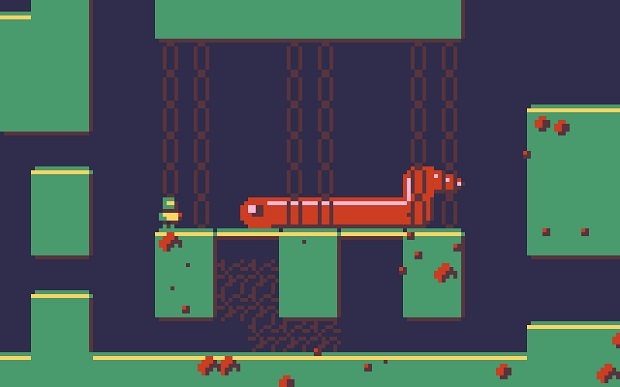 BLOODWORM, a title best screamed internally, is Whiting?s entry to the Ludum Dare 33 game jam. The theme this time is ?You are the monster,? and with that in mind the aim is to take control of this giant worm and escape some sort of facility, feasting on blood, growing and growing and ploughing into poor facility employees. Oh it?s marvelous, you?ve got to take a look at it. Watch it in action below, or play it for yourself for free on Windows and Mac.